Rating: 5/5 – A Hilarious Highlighting of Marvel Mistakes! Let me start by saying that this book is really, really funny! There are multiple pages where I laughed out loud as Marvel pokes fun at itself by highlighting their errors throughout their long published history. If you aren’t aware, since Marvel doesn’t issue them anymore, Marvel used to “award” letter writing fans a “Marvel No-Prize” for writing in and letting the editors know of mistakes they found within issues of Marvel Comics. It was called a “No-Prize” since there was actually no tangible reward given to the continuity questioning fans other than an empty envelope, but it was a point of pride for these nit-picky readers. In 1982, Marvel decided to highlight the their own mistakes with a whole issue dedicated to these errors! The idea behind this issue was credited to the Editor-in-Chief Jim Shooter with the help of writers and researches Jim Owsley, Roger Stern and Steven Grant. The book is narrated by Stan Lee in as he describes it, “caricature form”. Right off the bat, we’re introduced to a few mistakes that I actually went back and checked to see whether or not Marvel had corrected them in later reprints. For example, the first mistake highlighted is Peter Parker being called Peter Palmer, not once, but twice in Amazing Spider-Man number one. I pulled the Amazing Spider-Man Omnibus off the shelf and appreciated that they kept these mistakes in! There’s another example of the Hulk’s alter ego being Dr. Don Blake, or Daredevil being drawn holding a gun, with a red holster that is part of his costume! Some of the mistakes are really surprising and it was a great walk through of Marvel’s history. My favorite parts of this issue though were the examples of Marvel poking fun at their own writing. 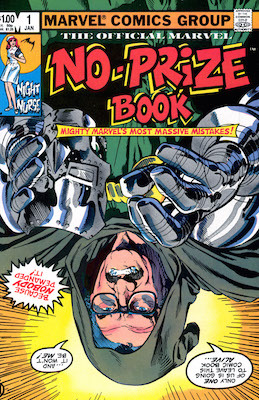 There’s a highlighted scene that shows the Thing flying a jet by catching and holding a broken wing to the frame of the airplane, or another goof where in issue 219 of The Hulk, the villain Captain Barracuda is looking through a periscope in one panel, and in the next is shown wearing an eye-patch over the same eye he was just using. It’s examples like these that made this issue so enjoyable. Marvel did a great job of pulling the panels right from the comics with a narration box that highlights the error. There are so many examples in this issue and I’ve only chosen a few so as to not spoil the surprises for you. As far as I know this issue hasn’t been collected, but it can be found as a back issue for pretty cheap. This is one of the funniest comics I’ve read in years and if you’re a fan of Marvel’s history, I can not recommend this book enough! This entry was posted in Marvel and tagged back issue comics, Jim Owsley, Jim Shooter, Marvel, Roger Stern, Stan Lee, The Marvel No-Prize Book. Bookmark the permalink.